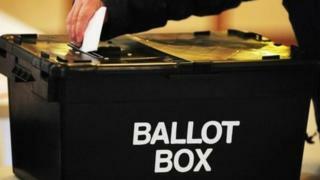 Two Northern Ireland parties have been fined by the Electoral Commission. The DUP received two £500 fines for inaccurate quarterly loans reports. The fine was paid on 14 August, according to the Electoral Commission. Traditional Unionist Voice (TUV) was fined £1,000 for the late delivery of spending returns for the 2017 general election. The Electoral Commission said there had to be transparency in the political finance system. "It's vital that voters are given an opportunity to see accurate and full reportable data on what parties spend money on in order to influence them at elections and referendums," Ann Watt, head of the Electoral Commission in Northern Ireland, said. "The commission will continue to enforce these requirements on all parties and campaigners to ensure voters have the information they need." A DUP spokesperson said: "Due to an administrative oversight our submission was incorrect. "The fine has been paid and the Electoral Commission has considered the matter closed."